Planning a party? 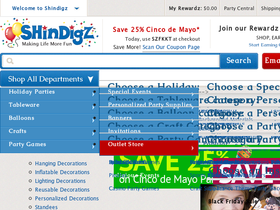 Shindigz, online at Shindigz.com, makes it easy to find everything you need in one place. Shindigz carries decorations, banners, tableware, party favors, balloons, invitations, games, and lots more. Whether you’re planning a theme party or a birthday party, Shindigz conveniently gathers it all into categories, making the planning simple and fast. For that extra pizazz, order a standee and party photo stand in from Shindigz, or create personalized party supplies. Before you go all out, see RetailSteal.com for Shindigz coupons, Shindigz discounts, and Shindigz promo codes. Shindigz ships Standard Delivery, 2-Day Express, or Next Day Delivery. Shipping to the US, US Territories, APO/FPO addresses, and Canada is available. Call customer service for international rates. Return product within 30 days of receipt for refund. See site for full details, exclusions may apply. Spend $85 or more on your order from ShinDigz and use this coupon code to save $12.75. Shop online at Shindigz.com and enjoy a 15% discount on your order. Use coupon code on orders of $85+ to qualify. Enjoy free shipping on your order from Shidigz when you use this coupon code at checkout. Must spend $85 or more to qualify for this offer. Enjoy free shipping on orders of $125+ with this coupon code from For Your Party. Act now and save $15 off your order of $100+ with this coupon code from For Your Party. Check out For Your Party online for their latest special offers.